For ‘America’s Railroad,’ this is a best of times, worst of times moment. The federal omnibus spending bill President Trump signed a week ago, covering the rest of the current fiscal year, gave Amtrak almost $2 million more than it asked for. This might be the the second time that’s ever happened, the first being the 2009 stimulus bill. How the railroad will spend that unexpected cash — which is roughly evenly split between its Northeast Corridor and National Network accounts — is far from certain. Amtrak's Chicago-bound Southwest Chief blows through the Highlands Metra commuter station in Hinsdale, Ill. on June 15, 2017. Photo by Malcolm Kenton. As announced this week, discontinuing the operation of most charter and special trains and disallowing private railcars to be taken on or off trains at stations where scheduled dwell time is less than 30 minutes, thus cutting off a revenue source and, more importantly, precluding opportunities to build public goodwill, taking tourism dollars out of local economies and rankling some of its most well-connected allies. Replacement of on-board chefs on the Capitol Limited with a limited pre-prepared menu similar to those offered on the Cardinal and City of New Orleans. This reduces the dining car staff to just two — a Lead Service Attendant and a food preparer/server — and leaves fewer menu choices, particularly for those with special dietary needs. There is a possibility that this change could be made system-wide. Passengers board the southbound Amtrak Texas Eagle in Marshall, Tex. on Oct. 29, 2016. Photo by Malcolm Kenton. Amid all this bad news for passengers and on-route communities, Amtrak insists that its goal is to “safely and efficiently operate our trains on schedule while minimizing federal subsidy” and to “make the customer experience more consistent across the network.” Perhaps it doesn’t matter to the company if the passenger’s experience is consistently poor, as long as it’s consistent. 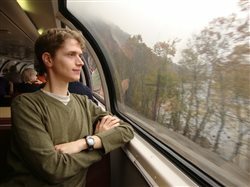 With coach fares often comparable to flights and sleeping car fares often costing more than first class air travel, these downgrades may tip prospective customers towards deciding it’s not worth it, even though the train still offers an inherently less stressful, more relaxing travel experience. It’s not clear whether the company’s policy and service adjustments are being driven solely by CEO Richard Anderson (former head of Northwest and Delta Air Lines) in an attempt to fit Amtrak into a more airline-like business model, or perhaps by presidential appointees on the railroad’s Board of Directors or others in senior management under particular political pressure from the Trump Administration. But they are clearly at odds with the desires of everyday train riders. In three weeks, I will be joining the Rail Passengers Association (on whose national advisory Council of Representatives I serve as a volunteer) for its spring advocacy conference in Alexandria, Va. and Day on Capitol Hill. We will ask members of Congress, who just arrived at a bipartisan consensus that intercity passenger trains are worth increased investment, to press Amtrak to use these funds to begin procuring new equipment for National Network trains, and to make clear to Amtrak management that Congress is concerned about service quality as well as safety and on-time performance. This feels like a pivotal moment where the shape of America’s passenger train network for the coming decades could be determined this year. Whether the course will be charted in back rooms at Amtrak headquarters, or by the American traveling public through their elected representatives, is the looming question. You can help move the needle in the right direction by raising your voice and letting decisionmakers know where you stand. Disclosure Statement: The author, in addition to serving on the volunteer advisory body of the Rail Passengers Association’s Council of Representatives, is a consultant to Herzog Transit Services, Inc., one of the private firms that is seeking to enter the intercity passenger rail market. He also does paid communications work for consumer advocacy group Travelers United and is a freelance Trains contributor.